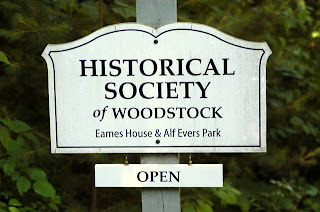 The Historical Society of Woodstock was founded in 1929 by a group of artists, writers, academics, and local citizens. In addition to the exhibition space, which is located at the historic Eames House on Comeau Drive in the center of Woodstock, the Historical Society has an extensive archive consisting of paintings, prints, drawings, sculpture, textiles, photographs, books, manuscripts, correspondence, documents, film/sound recordings, and antique tools. The archive serves as a resource for a wide range of exhibitions, public programming, and research. A fashion and history program presented by the Historical Society of Woodstock and Workday Wear. Join us for a special program that explores the history of Augusta Allen’s original Woodstock Dress offered by Woodstock Town Historian, Richard Heppner and, for the first time in eighty years, the unveiling of the “reimagined” Woodstock Dress as designed by Sarah Stitham of Workday Wear. Woodstock’s Christian Science Church, 85 Tinker St. Program also includes an Afternoon Tea, discussion and musical interludes presented by Reginald Earls and Timothy Hill. Join us for a special program that explores the history of Augusta Allen’s original Woodstock Dr ess offered by Woodstock Town Historian, Richard Heppner and, for the first time in eighty years, the unveiling of the “reimagined” Woodstock Dress as designed by Sarah Stitham of Workday Wear. ck, NY in 1913 with her husband, artist and entrepreneur, Willard Allen. Urged to make Woodstock their home by noted Woodstock artist Birge Harrison, the couple, upon their arrival, constructed a remarkablerable skills as a seamstress to work in an effort to support her growing family. No stranger to hard work – family members recall hearing the treadle sewing machine she used whirring well into the early morning hours - Augusta drew upon the early lessons of the frontier and an innate creativity to fashion what would become known as the Woodstock Dress. of fabrics were soon in high demand by the women of Woodstock. It could, for example, be either a casual everyday dress to wear to market or easily worn formally at a reception. The dress became a favorite of women within the art colony and was also worn by many of the Cheats and Swings square dancers during a number of exhibitions, including one memorable performance for Franklin and Eleanor Roosevelt at their home in Hyde Park. Though styles would change as time progressed, the history of the Woodstock Dress has been kept alive over the years through the efforts of the Historical Society of Woodstock and Augusta’s great-granddaughter, Deborah Allen Heppner. Over the decades, however, though the dress has attracted considerable interest by designers who have marveled at Augusta’s intricate work, the reproduction of the dress and its return to fashion seems to have been waiting these many years for the right person to take on such a task. That long wait is about to end. As a result of her discussions with Heppner, who also serves as President of the Historical Society, Stitham began to pursue the idea of bringing back the Woodstock Dress. “I became obsessed with Augusta’s ingenuity, fortitude and design style,” offered Stitham. That obsession has magically led to the first successful recreation of the Woodstock Dress in more than eighty years. As a result of Stitham’s creative efforts and collaboration with the Historical Society of Woodstock, the Woodstock Dress will return to the town that gave it birth on May 5, 2019. On that date, through a program that combines both history and fashion, Stitham’s “new” Woodstock Dress will be unveiled along with Augusta Allen’s story as presented by Woodstock Town Historian, Richard Heppner. The program will be held at the First Church of Christ, Scientist, 85 Tinker Street in Woodstock, NY from 3:00-5:00 pm. An Afternoon Tea and further discussion will follow the program. Music interludes by Reggie Earls and Timothy Hill will also be presented. Tickets for the event are $20.00 and can be purchased at the door or online by going to the Historical Society’s web page at: www.historicalsocietyofwoodstock.org. Note: You do not need to be a PayPal subscriber to reserve online tickets. All major credit cards will be accepted. June 15, 12-4pm. Exhibition Preview - NYS Path Through History. 12 pm talk by Woodstock musician, Rennie Cantine. Eames House, 20 Comeau Drive, Woodstock. June 29, 2-4pm. Opening reception – Woodstock Music: In Tune With the Times, 1600-Present. Refreshments, music by Rennie Cantine and Sabrina Miller. Exhibit open 1-5. Eames House, 20 Comeau Drive, Woodstock. June 29, 7:30 pm. Performance - Woodstock Music: Colonists, Warriors, Witches, a presentation with instruments, song, and shadow puppetry, exploring music history in the Woodstock area from 1600's through early 1900's. Woodstock Community Center. 56 Rock City Road, Woodstock. Donations appreciated. July 13, 12 pm. Panel discussion -The Impact of Music on Woodstock Culture, moderated by Woodstock Town Historian, Richard Heppner. Panelists: Happy Traum, Gilles Malkine, Rennie Cantine, Michael Birnbaum, Barbara Pickhardt. Applehead Studio, 1835 Route 212, Saugerties. August 24, 12 pm. Book signing, talk and music, Bill Horne, The Improbable Community: Camp Woodland and the American Democratic Ideal. Eames House, 20 Comeau Drive, Woodstock. H. Houst & Son Inc.
Something for everyone including: furniture, paintings, children's toys, books, tools, jewelry, art supplies, costumes, baskets, collectibles & vintage household items ... and much more! In addition, baked goods and coffee will be on sale. Saturday April 6 9:00 – 3:00 p.m.
Sunday April 7 10:00 – 3:00 p.m.
All proceeds benefit the Historical Society of Woodstock.